These pages have moved to http://www.nwsprints.co.uk where there are no annoying adverts, pop-ups or spyware and it responds quicker too! Aintree is an excellent, fast sprint course on the outskirts of Liverpool. In the '50's and early '60s it was a Grand Prix course, though we only use part of it now. It is, of course, home to the Grand National. Whilst it is used as a round of the British Sprint Championship it is also a fine place to start being fast, yet relatively safe (as long as you keep off the grass). For visitors it also has the advantage of being quite easy to learn. Liverpool Motor Club, who run events there have their own WebPages. Note they have track days there too on 29th May and 2nd October. Try the BBC 5-day weather forecast for Aintree. There is also an alternative description by Steve Liptrott of how to get around this place somewhat quicker published in Speedscene, the HSA magazine. Then, why not have a look at Fluke motorsport for another description and more videos. The start is clean and flat, but watch out if there is a strong tailwind - it just might push you through the beam inadvertently. You get up to third before the first bend, Country Corner, which is a 90 degree? lefthander. I think it tightens up a bit on the exit. There is plenty of run-off on the outside (been there, done that when the throttle stuck open!). If you do go off it's probably safest to let it go as I have seen a few people try to recover from the grass on the outside and end up in the solid earth bank on the inside. Then there is a decent straight where you get into top. Next comes, Village Corner, a fast sweeping right-hander which goes on for a while. This is one of my favourites as you really have time to feel what the car is doing. Of course, if it is not doing what is is supposed to then you have plenty of time to regret it too! I think a late entry is best - there used to be a gravel footpath on the left of the track which could be used as a marker for turning in. Be warned though, if you run out of road on the exit you'll be on the Grand National course at about 100mph with no grip and some jumps to think about. d) have no intention of ever asking my daughter out for a drive. The Beechers Brook fence is on the outside of this bend, hence the name. Although the fences look a long way away, they really are solid and it takes a long time to stop on the grass. To add insult to injury I believe you are charged for repairing damage to fences or ploughing up the adjacent golf links. Nowadays there is just a shortish blast to the finish line about 200? yards after Beechers. The final straight used to go on for another 200-300 yards, but has been shortened for safety reasons. Anything fast used to carry on up the escape road rather than take the normal return to the paddock, but in a slower car you could get out your knitting whilst waiting for the finish line. A chicane was tried for a while. There are rumours of adding a completely new bend on the final straight, which would certainly get my vote, but tarmac is unbelievably expensive..
See also the BMRC page. It is about 5 miles north of Liverpool. At the M57/M58/A59 junction, take the A59 towards Liverpool. Go past ASDA then a few hundred yards later turn left at the lights. Follow the road around to the right keeping the shops on your left. A mile or so later turn right just before some shops onto the Melling Road (B5184). Go over the hump back bridge then a few yards further on turn left onto the service road. Park somewhere on the right. Map. No hassles getting to the start line. Having a beer in the club house afterwards. Nothing really (apart from being 4 seconds off the class record). 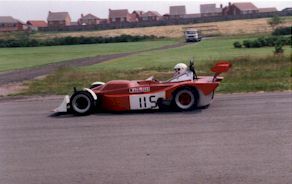 These are courtesy of Ron Hunt of the Liverpool Motor Club. They relate to the current course as run over the last 2 years. Immediately prior to that the course was considerably shorter (as reflected in the times in the table following this one).